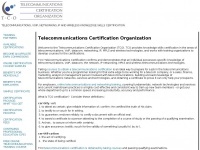 Telecommunications Certification Organization (TCO) provides vendor-independent certification of telecommunications, VoIP, SIP, networking, IP and wireless technology knowledge for individuals and employers. May be used as the basis for Continuing Professional Education (CPE) contact hours credits for self-study. The web server used by Certify-tco.org is run by Steadfast Networks and is located in Chicago, USA. The server runs exclusively the website Certify-tco.org. A Apache server hosts the websites of Certify-tco.org. The website uses the latest markup standard HTML 5. The website does not specify details about the inclusion of its content in search engines. For this reason the content will be included by search engines.